Winners of the national competition in UK, team SureLight has been awarded JA Europe Company of the Year 2018 thanks to their outstanding accomplishments during the three phases of the competition: stage pitching, jury interviews and stand exhibition. This award celebrates the student company that demonstrates the best approach to communication, teamwork, problem-solving, objective-setting, personnel management, product development, customer focus, marketing and financial results. SureLight impressed the jury, chaired by Zoran Petrović, Chairman of the Managing Board at Raiffeisen, with their company producing a smart brake light for bicycles. Team SureLight, as a group of cyclers, wanted to improve security by using car's brake light technology and making it available for bicycles. SureLight not only won the title of Company of the Year, they also won the "Citi Foundation Client Focus Award" and two teams members were recognized with the "JA Alumni Leadership Award" supported by AXA. "We’ve learned so many lessons taking part in the JA Company (Young Enterprise) programme, running a student company alongside an intense school curriculum. I really hope it can inspire further generations, because there is no other way to learn to be an entrepreneur than just do it yourself," shared Ben Ray, Managing Director of SureLight. “We are about to celebrate the 100th anniversary of the JA Company Programme. Because it is experiential, hands-on and involves business volunteers, it continues to inspire thousands of young people in more than 100 countries year after year. JA Company Programme alumni not only discover entrepreneurship, but they are more motivated for school and improve their performance in other subjects. This unique real-world programme has a deep impact on young people’s entrepreneurial competences, financial capability and work readiness; it prepares them well for a fast-changing future,” said Caroline Jenner, CEO of JA Europe. Last school year, the JA Company Programme counted over 340 000 participating students across 40 countries in Europe. Through the process of learning to run a company from top to bottom, the JA Company Programme students create and market real products and services. The success of the programme is largely down to the wide support from business volunteers, acting as mentors, offering expert advice to the students. Partnerships between education and business are essential to closing the gap between classroom theory and real-world challenges. AT&T Excellence in IT Award recognizes the student-company showing the best innovation-driven concept, strong business potential, sustainability, viability and scalability. Citi Foundation Client Focus Award recognizes student enterprises that excel at creating value for their clients, listening to their clients and walking in their shoes to understand their world, anticipating and serving their changing needs. Delta’s Innovation Award recognizes the student company which has an innovative or effective approach for solving a problem or developing further a product, has a potential to prosper and has an international prospect; whose idea is easy to implement and has a functional business model. ManpowerGroup "Ready for Work" Award recognises those teams that have the best-built work readiness skills during the competition. This year, ManpowerGroup presented the award for the project with the most significant impact on developing learnability, a key component of work readiness. TeleGroup Best Business Philiosophy Award recognises the JA company which can demonstrate strong market potential, tech driven innovation and social responsibility. JA Europe is Europe’s largest provider of entrepreneurship education programmes, reaching 3.6 million students in 40 countries in 2017. 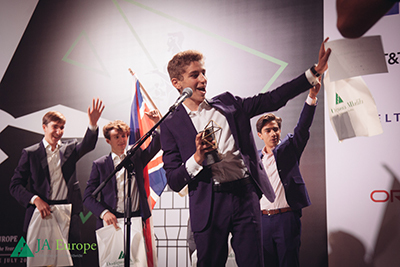 JA Europe brings the public and private sectors together to provide primary and secondary school students and university undergraduates with high-quality education programmes teaching them about enterprise, entrepreneurship, business and economics in a practical way.